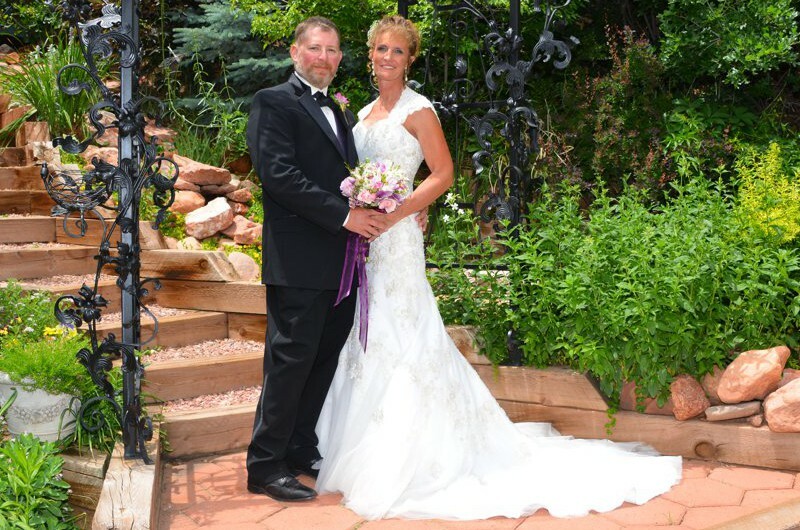 Colorado wedding photography is a lot of fun because we are located in such a beautiful area. Most of the photos on this website were taken on the 2 1/2 acres that comprise Blue Skies Inn. 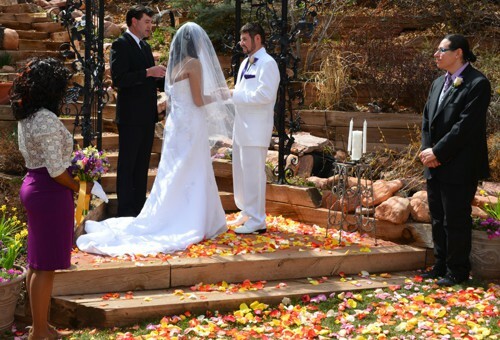 We think that the quality of the photography portion of our romantic Pikes Peak Wedding packages makes them a great value. For less than the average price of wedding photography alone, you will get everything else that you'll need to create a perfect wedding day. We promise that you will love your photos and that you will enjoy the photo shoot. 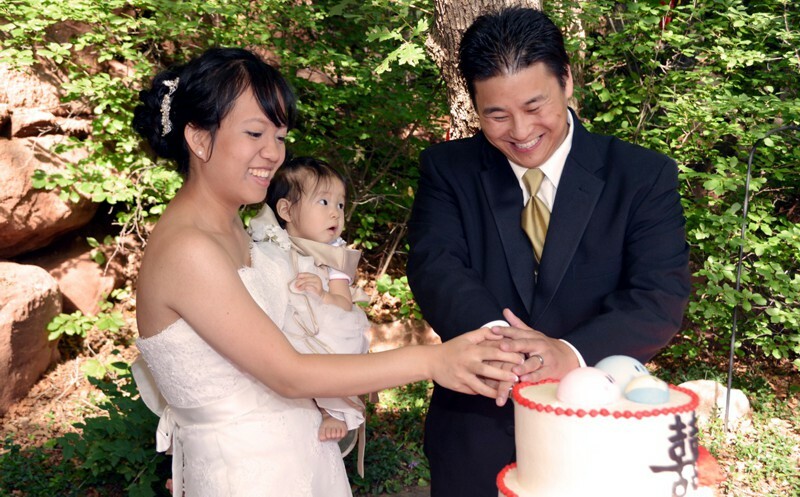 Your package includes photos of your wedding and portraits. As you add guests, the number of your photos will increase. 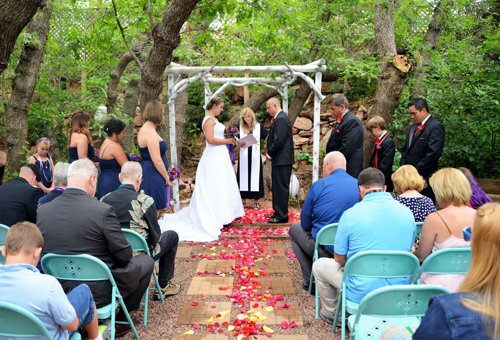 While reading the Pikes Peak Wedding website, you've probably wondered why the innkeepers created all-inclusive wedding packages. Yes, we do like having new guests at our Bed & Breakfast here in Manitou Springs. However, the true reason goes deeper than that. We have an innkeeper with an art degree. 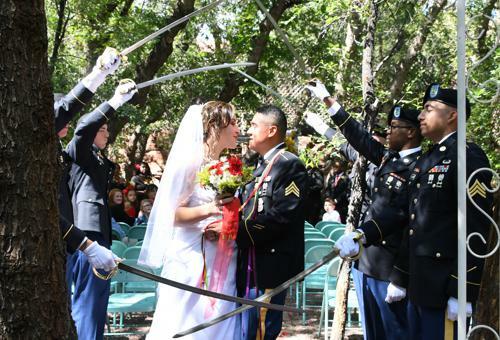 What better way to use that training than taking great wedding photographs? 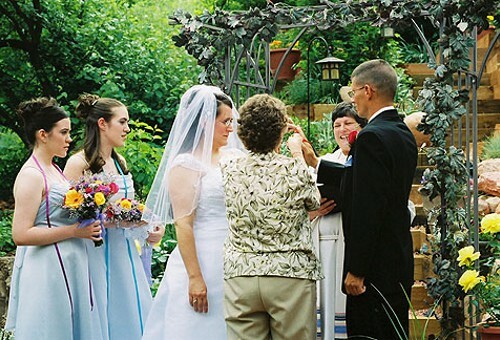 Sally has enjoyed creatively photographing about 400 weddings, and all of the photos on this website were taken by her. 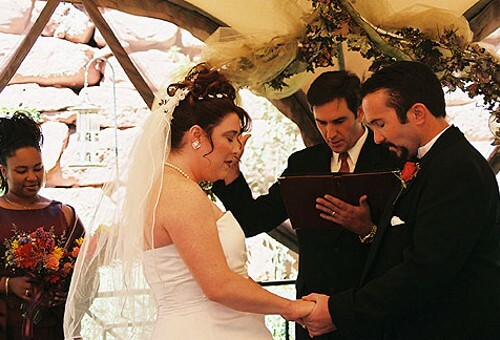 If you go to the links at the top of this page and click on weddings by season, then click on the individual portraits of our couples, you will be able to see a sampling of photos from each wedding. If you visit our bed and breakfast inn in anticipation of booking your wedding here, we have many complete albums to show you. 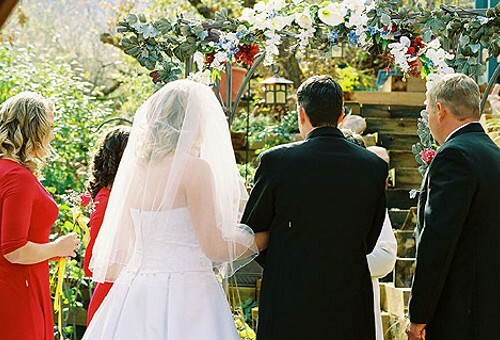 When the bride walks into the garden to meet her groom, we start a detailed photo log of your ceremony. 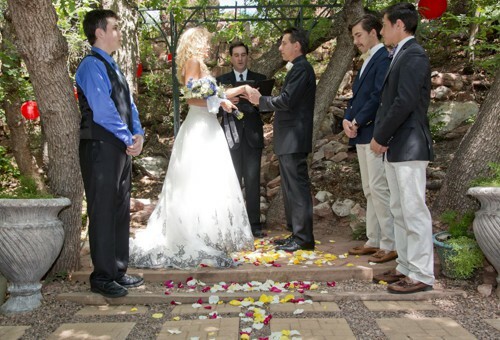 We'll photograph the groom as he sees his bride, your vows, ring exchange and first kiss. After you are pronounced as husband and wife, we photograph the couple signing the wedding license, their guests toasting their happiness and the cutting of the wedding cake. After a brief reception where everyone gets some wedding cake and cider, Sally shoots the bride and the groom posed with their wedding guests. Once that is done, the bride and groom pose for wedding portraits . 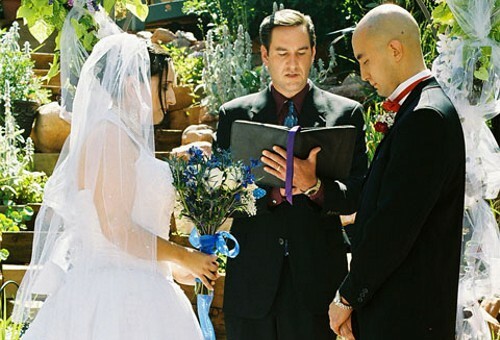 By the end of your wedding day, we will present you with a data-DVD which will contain large JPEG images of your wedding day suitable for almost all purposes. These JPEG files will produce color prints of excellent quality without "pixilating-out". up to about 9x15 inches. Your data-DVD will also include camera generated Nikon Electronic-image Files (NEF), a kind of "digital negative" of each photo. NEF files are the Nikon version of .RAW files, and they can be used by any photo shop to generate huge, detailed picture files, which in turn can be used to produce detailed blow-ups of some part of an image or a very large print of a whole image. 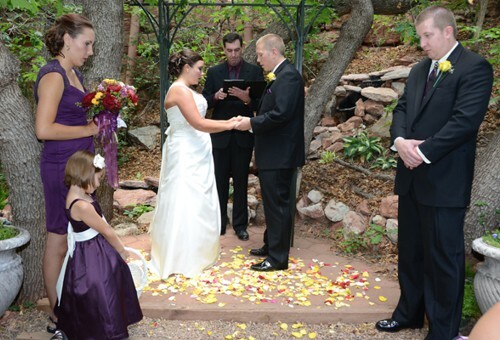 As part of your Pikes Peak Wedding package, you will own the photo copyright. That means you can make reprints for family and friends, as well as create your own enlargements for a special wedding album, without being required to obtain permission or incurring additional expense. 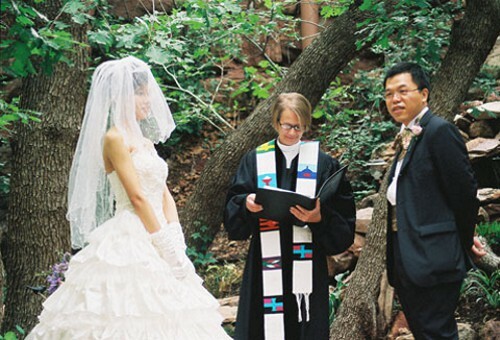 Our Wedding Photography Style may be called old-fashioned. Yes, we may have (reluctantly) abandoned film in favor of a modern digital camera, but only after we made sure that our wedding couples would receive the same quality product that film-photography offered. 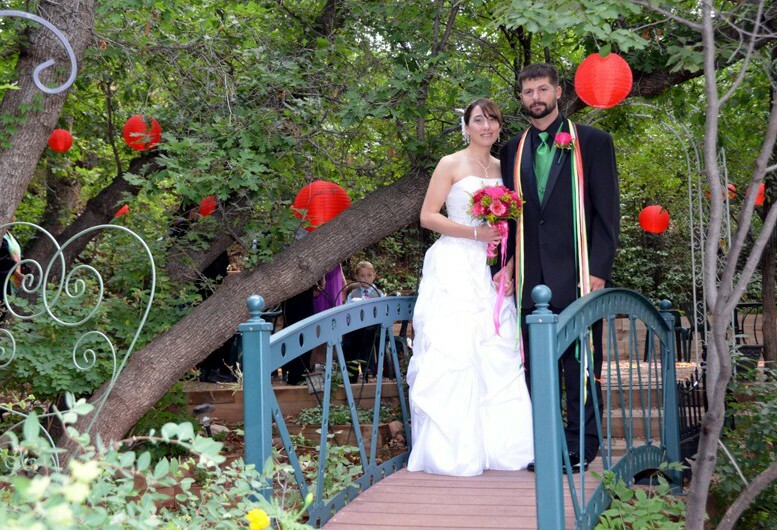 There are many photo opportunities here at Blue Skies Inn. 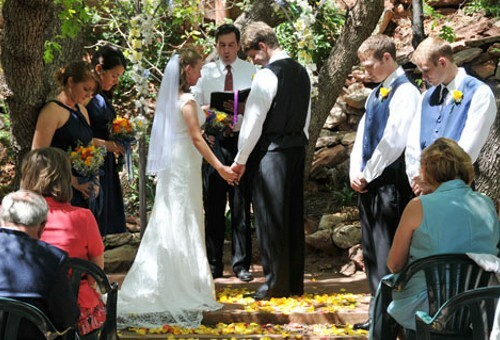 After your wedding ceremony, reception and family photos will be taken. 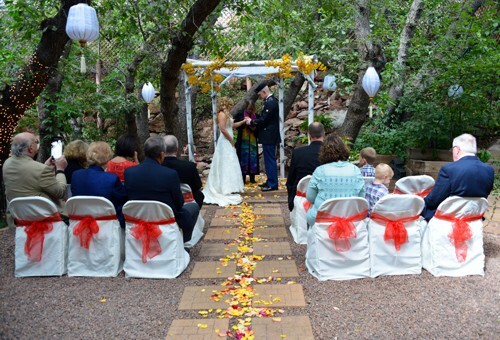 Then the bride and groom will be photographed in our flower gardens, by the waterfall, on the garden bridge, with Pikes Peak in the background, and in the hillside garden. 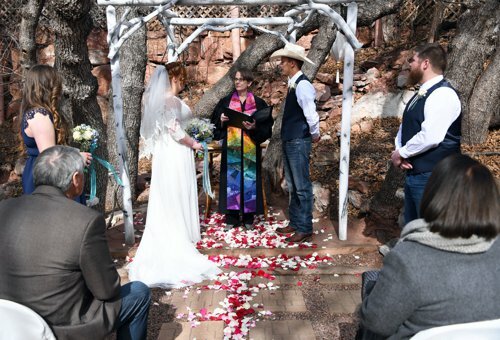 Other photos will be taken by the stained glass windows of the historic Briarhurst gothic revival carriage house and with our stream in the background. 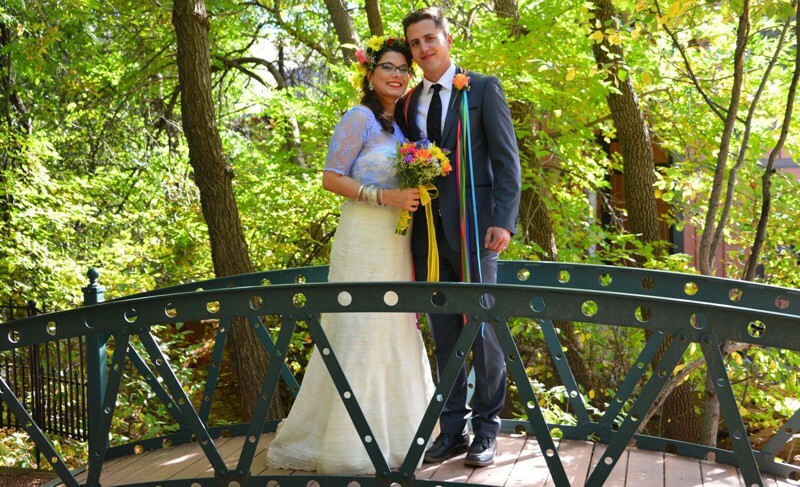 The shade under towering cottonwoods by our gently arched stone bridge is also a beautiful site for wedding photography. We always welcome suggestions for new poses. 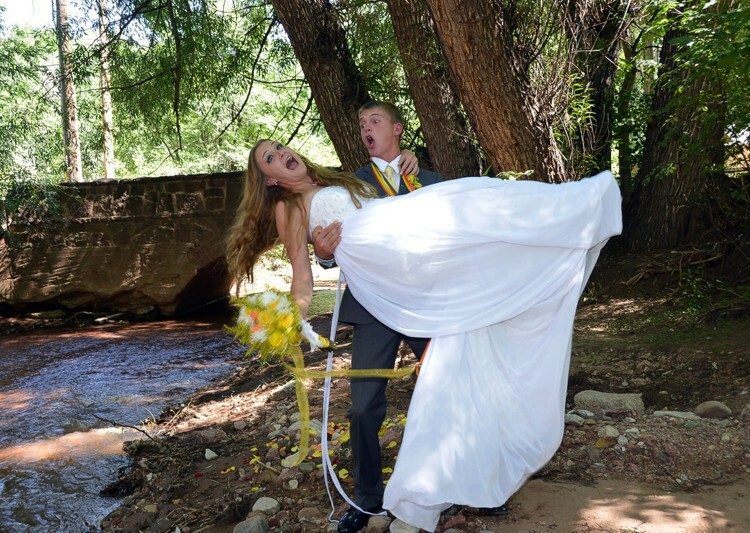 Last autumn, a bride took off her high heels and leapt onto a massive boulder in the stream for a photo. We're always happy to try something new for you. If you'd like additional wedding photography beyond the number specified by your wedding package and guest photos, you may choose to have photos taken at an additional cost of $3 per exposure. Remember, if you invite guests, we automatically include more photos as part of the price per guest, increasing your photos by 10 exposures per every twenty guests. Your Wedding Photos Will Be Online! 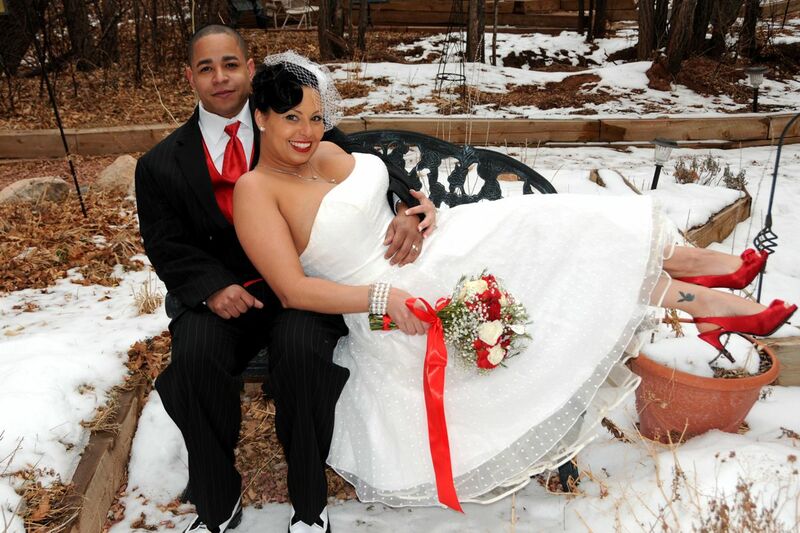 Soon after your wedding, we will have posted a photo of you on our website as our most recently wed couple. If you click on the thumbnail photo, there will be 30 to 70 additional photos displayed as a pop-up, a perfect way to have your far-away friends and relatives see you on your wedding day. You will be able to print those photos from the website. Say, "Yes" to the dress! 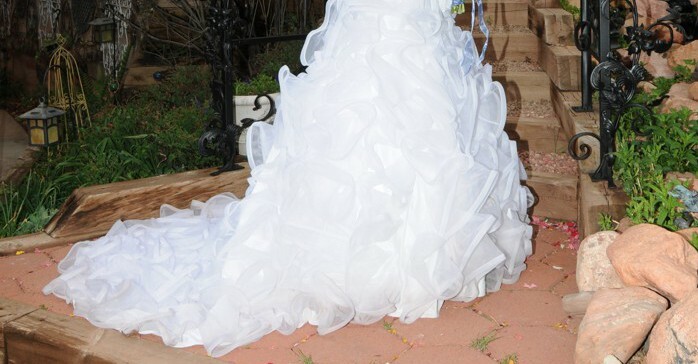 We know you spent some time picking out your wedding dress. 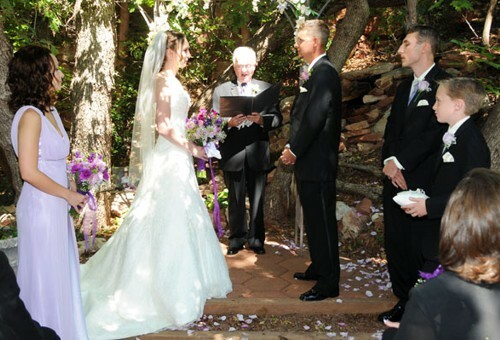 Sally makes sure she documents every aspect of your special day! It means that you can catalogue your photos at home on your computer or hi-def TV, instead of trying to sort through a batch of low-resolution photographer's "proofs" plastered with the photographer's logo. It means you can have your photos printed at your local camera shop, drug store or market, rather than pay a premium to the photographer's studio and then wait while they process your request at their convenience. It means that you own your electronic photographs and negatives, and you can do anything -- anything!! -- you want with your photos. 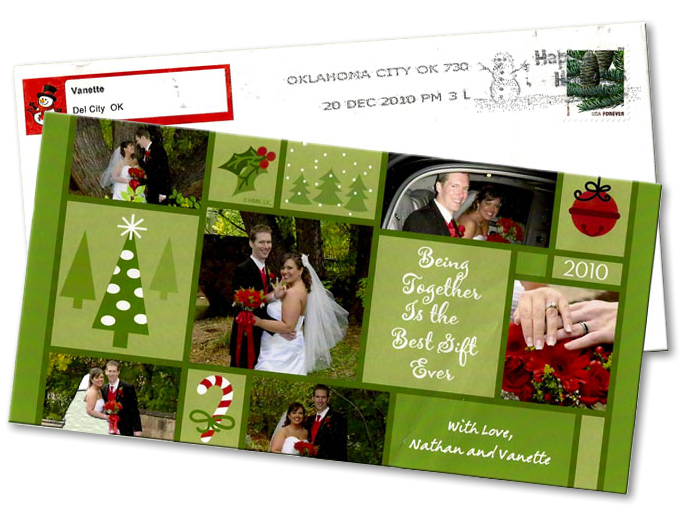 Make multiple prints or digital copies, make portrait-size blowups, Photoshop them into art, put them on line or even use them in your Christmas cards! View an entire Pikes Peak Wedding photography session with the pictures presented in the order they were taken! 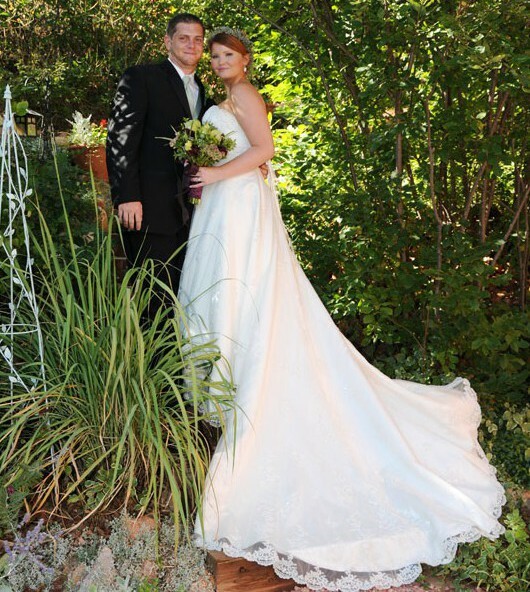 We have uploaded the entire photo shoot of the wedding of Mallory & Kyle on September 18, 2010, onto four web pages. Click on the picture on the right to view the first page of our sample photo shoot. These photos are displayed herein with permission of the copyright owners. Other use of these photos, or any photos on this website, without the express, written permission of the owners is strictly prohibited. All rights reserved. CAUTION: The web pages of our Sample Photo Shoot are extremely graphic-heavy. They will take a LONG time to load, even with a high-speed connection, BUT it'll be totally worth the wait.